The real estate market in Crimea is starting to pick up. A long ban on real estate transactions has at last been lifted and market players are hoping for demand from foreign investors. However, experts warn against haste and recommend waiting for the system to start operating in full. Under Russian law, the buyer and the seller first sign a sale and purchase agreement and then file an application with Rosreyestr to have the deal registered. In the meantime, the money for the property that is the subject of the agreement is either kept with a notary public or in a safety deposit box in a bank. Rosreyestr then checks whether the transaction is "clean", specifically whether there are any restrictions on selling the property (a mortgage, for example) or who is listed as its owner. The real estate market in Crimea is about to come out of the limbo it has been in since March 2014, when the new authorities imposed a moratorium on transactions. The Russian Federal Service for State Registration, Cadastre and Cartography (Rosreyestr) has now started operating on the new Russian territories. Its head office is based in Simferopol, with local branches to be opened in the main resort towns of Yalta, Yevpatoria, Kerch, and Sevastopol. Over the past three months, the Crimean real estate market has been in limbo. Maria Litinetskaya, managing director of the Metrium Grupp real estate company, explains that since the moratorium, it has been impossible either to buy or sell property legally. "Some local residents have found a way out. They signed preliminary sale and purchase agreements, with the actual transaction deferred, say by six months," she adds. The change in Crimea's official status has caused a spike in buyer interest, especially in Russia. "From February 19, 2014 up until the day of the referendum (March 16), the number of queries from prospective buyers grew by 380 per cent; while in the first 24 hours after the referendum, it increased by a further 50 percent. This level of interest is being maintained," say analysts from the investment and construction holding company Premyer. According to the DOMnaMORE.ru website, while previously users were interested in Montenegro, Bulgaria, Croatia and Ukraine's Black Sea coast, since mid-March, two-thirds of queries have concerned summer residences in Crimea. According to experts polled by RBTH, if previously the demand was formed mainly by Ukrainians (50 percent), with Russians accounting for 35 percent and the remaining 15 percent generated by customers in other former Soviet Union republics, mainly the Baltics; now 70 percent of calls to Crimean real estate agencies originate from Moscow; 15 percent from St. Petersburg; 5 percent from Belarus, and another 5 percent from other CIS countries. A buoyant demand has pushed prices up. According to market participants, over the past three months, dollar prices (transactions in Crimea were denominated in dollars) have risen by 12-15 percent, while in popular locations, prices have nearly doubled since the start of the year. 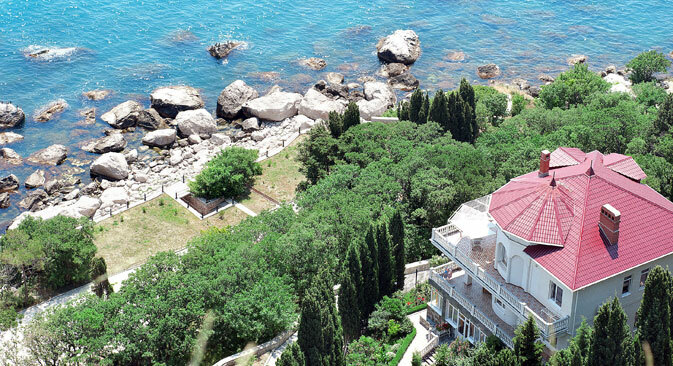 The most expensive land is on Crimea's south coast. Prices for first-line plots of land there can reach up to $70,000 per 100 sq.m., with the average price fluctuating at around $20,000 per 100 sq.m. The farther from the sea, the lower the price. Land located 2-3 km from the sea costs $500-$2,000 per 100 sq.m. Private buyers were rapidly followed by Moscow investment companies. "The majority of investors are interested in large plots of land for building apartment blocks there. One could say that Moscow investment is being channeled into Crimean real estate," said Roman Muradyan, managing director of the MIEL network of real estate offices. The Crimean real estate market expects that foreign investment will soon follow in the footsteps of Russian capital. So far, there are not that many foreign buyers considering purchasing a flat for vacations in Crimea. However, local real estate market players expect that foreign investors will become interested in buying land suitable for later building hotels upon. Despite the fact that from now on real estate transactions in Crimea will be conducted in compliance with Russian regulations, certain risks remain. There are currently huge lines outside notary offices in Crimea to have deals notarized. These lines are largely made up of those who have concluded deals in the last three months and are now in a hurry to have them properly processed, Premyer analysts explain. "It is possible that a large number of intermediaries offering their services may emerge. The quality of their work is extremely dubious. There may be quite a few swindlers among them. That is why our advice is to deal with all the paperwork yourself," they add. Experts warn that the situation is unlikely to stabilize sooner than in six months' time. Most importantly, Russia has not yet reached an agreement with Ukraine on having the register of Crimean real estate transferred to it. A buyer may therefore get a flat that the previous owner has listed as a security for a bank loan and that could be seized by the bank should the loan not be repaid. As Krasnobayeva explains, Ukrainian laws, which used to regulate Crimea courts before the region became part of the Russian Federation, are different from Russian laws. Therefore, it will take time for existing judicial practice to adapt, including where real estate disputes are concerned. It makes sense to invest in Crimean real estate only if the characteristics of the property and its price outweigh the risks, she concludes.